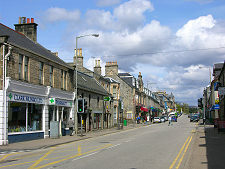 Grantown on Spey lies at a height of 220m in Upper Speyside and is by far the largest settlement for some distance in any direction. Largely built of grey stone, it is a fine town conveying an air of established solidity. 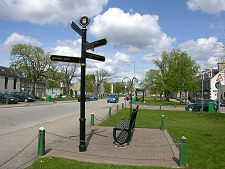 These days Grantown on Spey is bypassed to its south by the A95. The short detour needed to explore the town is well worth the effort. The origins of the town are clearer than most. The original settlement in the area was at Cromdale, dating back a thousand years, located on the River Spey two miles east of Grantown on Spey. This was bypassed when a new bridge was built across the Spey to carry the military road from Corgarff Castle in Donside to Fort George in 1754. 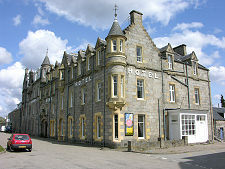 The other strand leading to Grantown on Spey's creation dates back to about 1500 with the building of Ballo Castle on higher ground about a mile north of where Grantown on Spey is today. This passed to the Grant family in 1694 and after a period during which it was called Castleton of Freuchie it became known simply as Castle Grant. 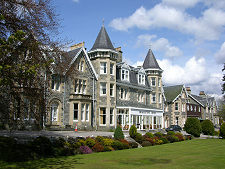 In 1765 it was rebuilt as a grand mansion for the laird, Sir James Grant. 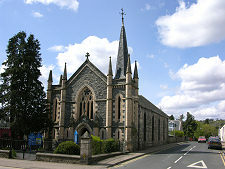 Grant's ambitions extended beyond his castle, and in 1766 he founded Grantown on Spey in open country at a point where the military road joined another road following the north side of the Spey from Aviemore. Here he laid out much of the town you see today: and here, too, he rehoused tenants displaced by agricultural reform he imposed across his estates. In 1863 two competing railway lines arrived in Grantown on Spey. 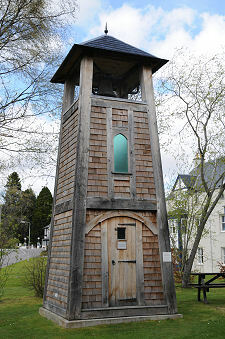 These fed the town's industries which at various times ranged from wool to candle making, brewing and a distillery. The brewery only lasted for a short time after its opening in 1780. 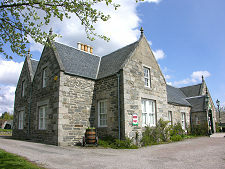 The Balmenach Distillery was longer lived, from 1824 until 1993, when problems finding the investment needed to meet effluent standards led to its closure. But the coming of the railways also had another effect that outlasted their closure in 1965. 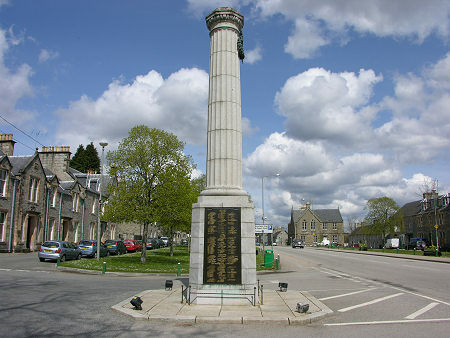 The altitude, the generally south facing location, the nearby scenery of the Spey valley, and the attractions of a well planned and well constructed town brought Victorian tourists in large numbers, and they have been followed by successive generations of visitors ever since. 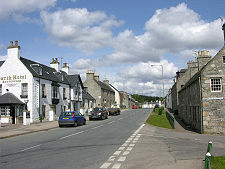 Grantown on Spey is built around an extended grassy oblong through which the main road passes. Especially striking are the large number of hotels, guest houses, and B&Bs. There is also a large camping and caravanning site here and hostel accommodation. No fewer than 18 hotels were counted in the town in 1980, the number is probably not much smaller today. 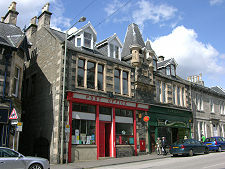 The hostel is significant because the south side of Grantown on Spey is now brushed by the Speyside Way long distance footpath. Anyone sticking rigidly to the path could avoid all but the very edge of the town. 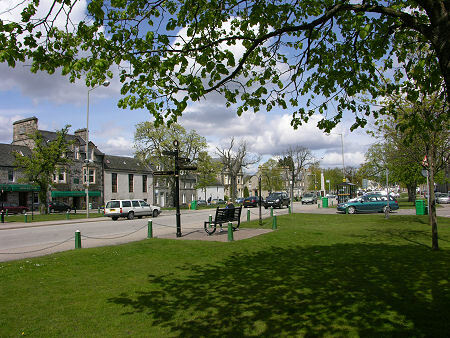 But given the accommodation options available here, plus the wide range of eating, drinking and shopping opportunities in the town, we suspect most people detour a little from the path to explore what Grantown on Spey has to offer.